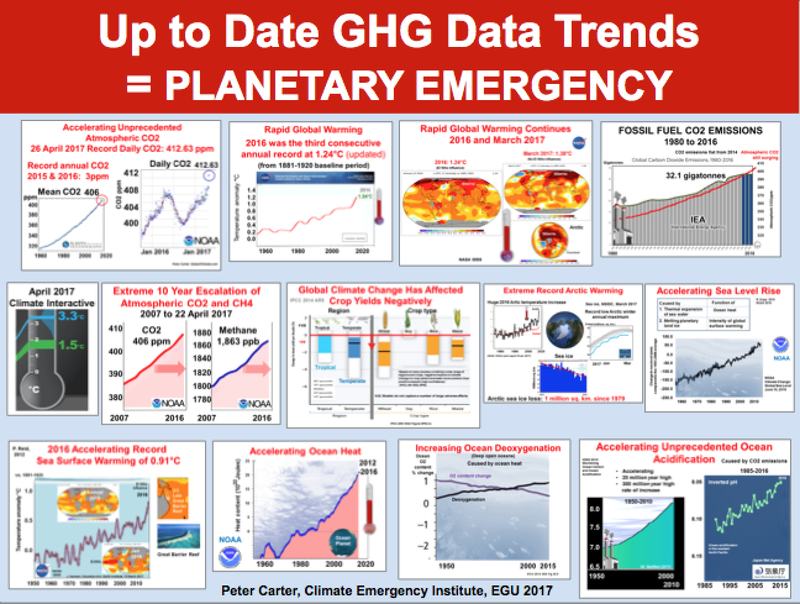 COMPASSIONATE CLIMATE ACTION: What's the Right Word for "Emergency"? Holy flying freak out! The atmospheric concentration of carbon dioxide hit over 412 parts per million (ppm) this past week! We're still setting temperature records, especially in the Arctic. Despite fossil fuel CO2 emissions being flat over the last few years, CO2 concentration is still increasing — and at an accelerating rate. Sea level is rising at an accelerating rate. The oceans are heating at an accelerating rate. Unprecedented ocean acidification is increasing at an accelerating rate. 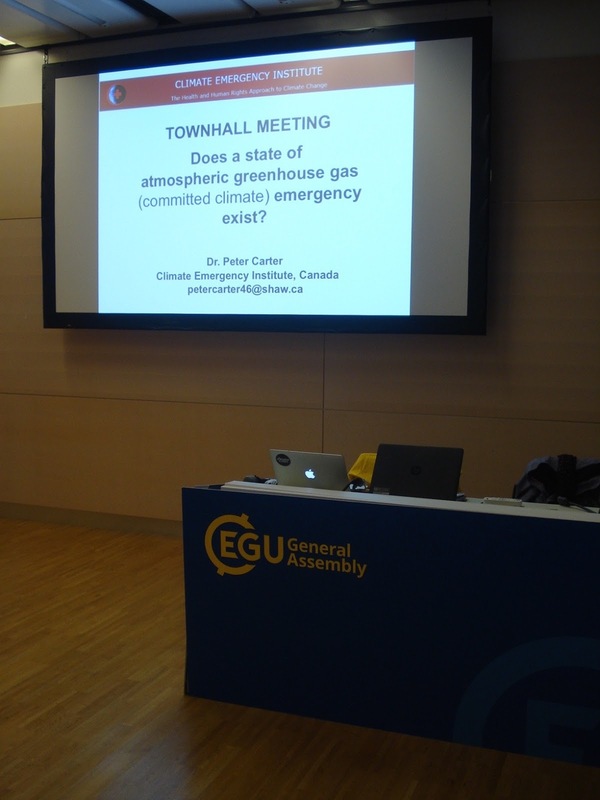 And ocean de-oxygenation is on the increase, as well. If you understand global warming and climate change, you'll understand how distressing all of this is. But if you don't understand it, what can I say to explain that this is an emergency — even though you're not bleeding or in pain? Yet. Look at this. 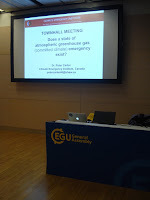 It's a fuzzy version of what my hubby just presented at the European Geosciences Union (EGU) General Assembly. Just note how all the graphs are on the upswing. 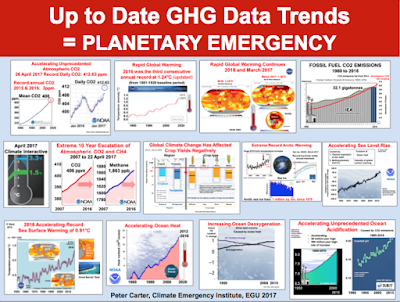 All of these data trends point to a planetary emergency ... but still, amongst the public (and even amongst the vast majority of scientists, it seems), there's no sense of panic or urgency. No sense of impending calamity or danger. No sense of crisis or emergency. What's a gal who cares about the biosphere — and all the children, of all species — to do? What WORD is going to help people grasp the plight we are in? What metaphor will help people get that we're in a doomsday scenario? Please, I'm begging for help here. Can we put our heads (and hearts) together globally and come up with the right words to say? The right metaphors and analogies? The right graphs and graphics? Can the advertising agencies of the world do some pro bono work in order to help us safeguard the future? Can the artists and musicians come up with ways to wake up the public? We are so close to the point of no return (if not already past it) that my plea is a desperate one. Can you help solve this problem? Or do you know someone who might be able to?